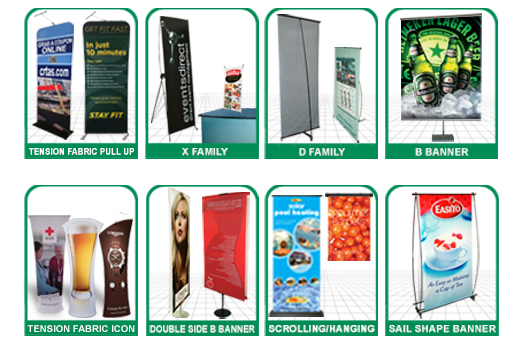 Pull up banner stand | X stands | L shape stand | Contact Displays - Portable Display Stands Products - BANNER DISPLAY STANDS - roll up, banner stands, banner, pull up, pop up, table promo, plinth, screens, walls, prints, sticker, light box, brochure holder, catalogue holder, flags, tear drop banner, admats, vehicle graphics, inflatables, promo items, outdoor banners, outdoor display, vinyl, pvc, canvas, polypropylene, gloss paper, gloss art, fabric, material fabric. Click on the image to open the product page. Copyright 2017 Contact Displays Ltd. All rights reserved.